Rowan University and Cooper University Health Care are proud of their unique partnership, initiating the next generation of medical education and improving health care delivery throughout the region. With national rankings and a history of educational leadership, Cooper and Rowan were well prepared to develop the first new medical school in New Jersey in 30 years. Students in the four-year allopathic program graduate to serve the greater South Jersey community and beyond. We are proud to announce that in June 2016, CMSRU received full accreditation for the maximum period of five years from the Liaison Committee on Medical Education, the nation’s accrediting body for MD-granting medical schools. We are rethinking health care delivery from the ground up. We are building the backbone for a growing industry sector in medicine, biomedicine and technology. We are increasing educational opportunities in the region and boost economic development. Most importantly, we are creating a medical school that will be revered for its innovations as well as the talent of its graduates and the impact they will have on our region. 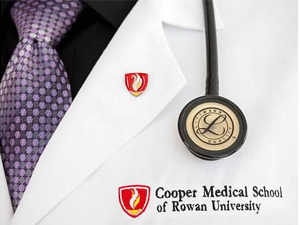 Explore the partnership of two of South Jersey's leading institutions, whose proud paths have come together to form a new mission - the Cooper Medical School of Rowan University. New Jersey ranks 33rd in medical school graduates per capita in a nation that already has a shortage of doctors. More than 30,000 South Jersey residents cross the river annually to Pennsylvania to get specialty care at academic medical centers. Medical schools create at least $3 in economic activity for every $1 spent. South Jersey loses $2 billion in economic activity to Philadelphia medical centers each year. Cooper Medical School will begin to reverse the trend of medical dollars going across the bridge to Pennsylvania and Delaware. Visit www.rowan.edu/coopermed for the latest news on our faculty, staff, and graduates.